We are “Sago New Material Guitars” at Amagasaki chity, Hyogo prefecture, Japan. Our company mainly makes original guitars and basses to order. March 27th is the Day of Sakura(Cherry blossom) in Japan. Sago has a deep relationship with Sakura. 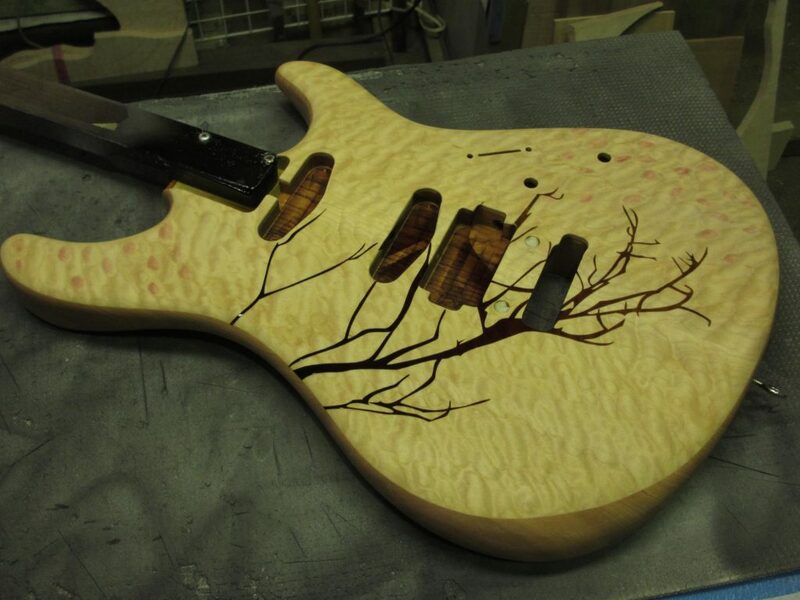 This time, we will introduece to you some guitars and basses that we have been making with Japanese motif. We will show you some models with the design of Sakura. Sakura Sonia was created as the Japan Expo Model in France in 2014. 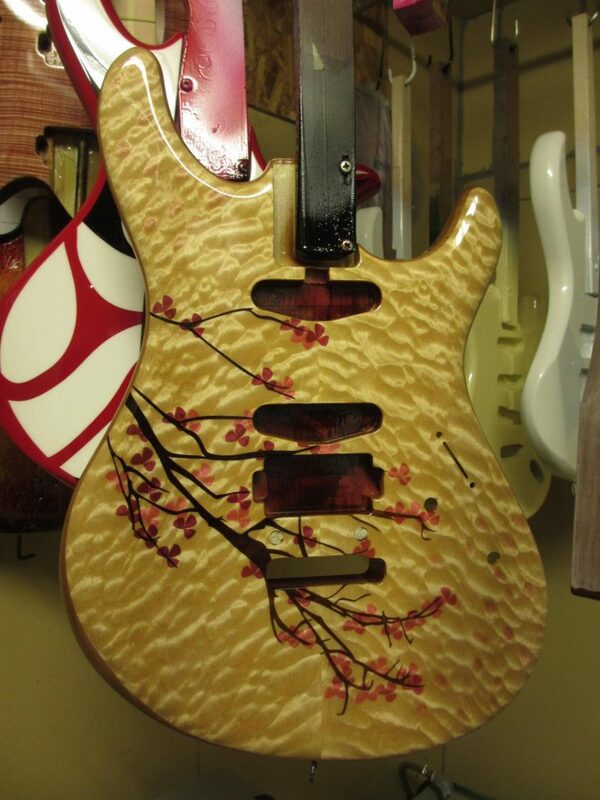 It is designed as an image of Sakura storm and we display the pattern in the quilted maple on the body top. First, we use masking tape to paint only the branches of Sakura. Next, we make the shape of Sakura petal with the masking tape like branches. We paint pink color and saflower color delicately to make it like a dancing Sakura storm. 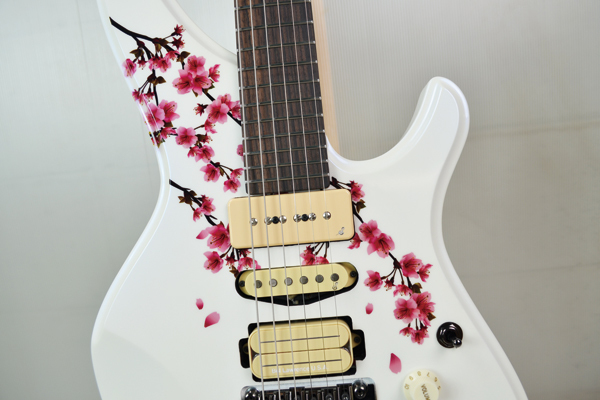 We put Sakura design on the fingerboard also. The Sakura petals wave in the wind and the natural warmth of the wood is shown in the grain of the tree. And, we color it dark red, so you can feel the Japanese spring. Likewise, this is the head of Difi which is also Sago’s original bass and is was made in the same way. In this particular case a Japanese apricot blossom is shown blooming. It is possible to do this by putting an inlay, letter, or illustration that you like, using a waterslide transfer. 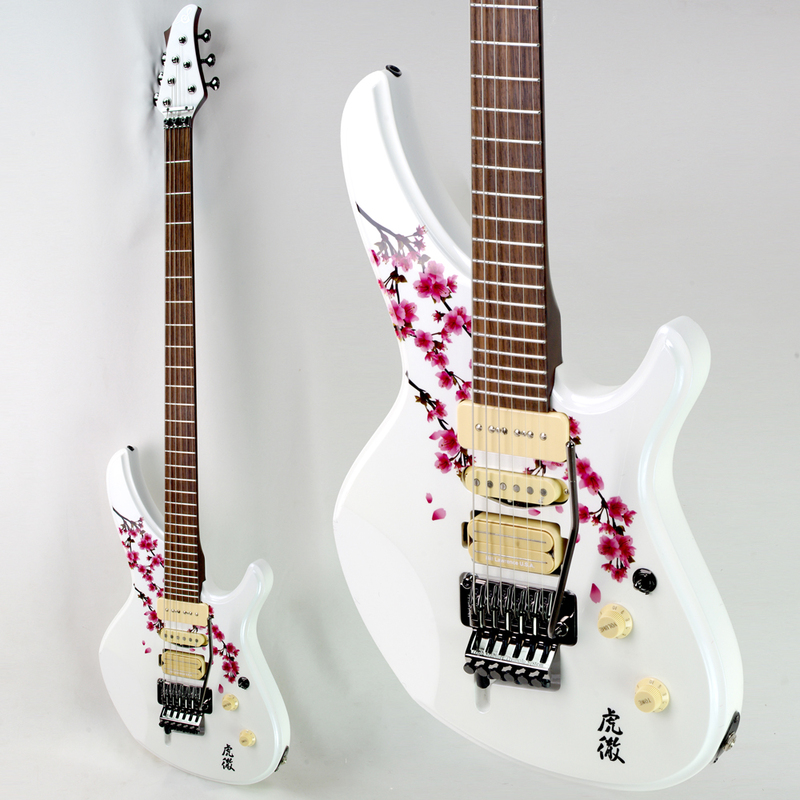 And the guitars and basses with our Japanese style including this Sakura Sonia made an impact at Japan Expo 2014. It was so popular there. You can watch a part of the live show on YouTube if you like. Colorful Sakura is painted on the body top. 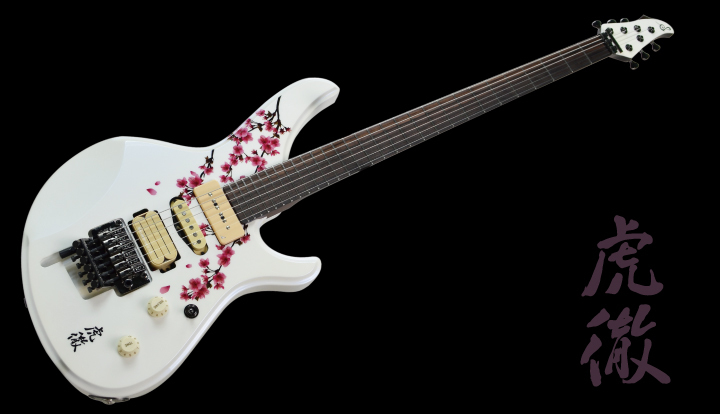 If you would like the sensitive design or gradation on your guitar, we will ask the cooperation company to paint with inkjet print on the body top of it. This can only be carried out if the body of the guitar is flat. 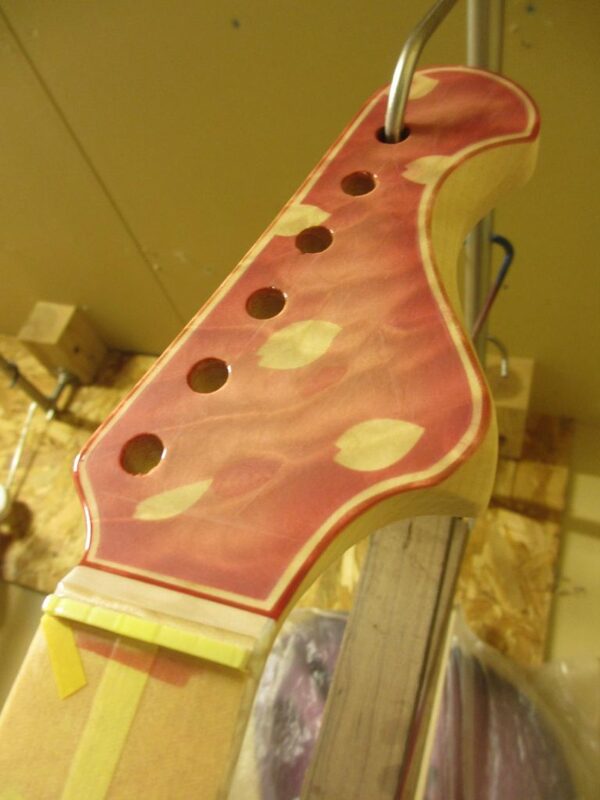 If it is necesary to paint delicate design to the curved part of an arch top guitar, we also use a waterslide transfer. He wanted to have a guitar that reflects Japanese style, because he is a guitar player in the WaggakiBand, so that is what we made for him. Kotetsu has proved popular and you can order the same model. And we were able to see Kotetsu *Seed ver. with a Japanese designed sticker or an imitation Japanese embroidery design. *Seed is the brand produced by Sago for students of instrument. We saw many original guitars & basses on the Day of Sago, the photo contest of the 15th anniversary of Sago on Twitter and Instagram. We are looking forward to promoting Sago’s guitars and basses. They will be so popular from now on. 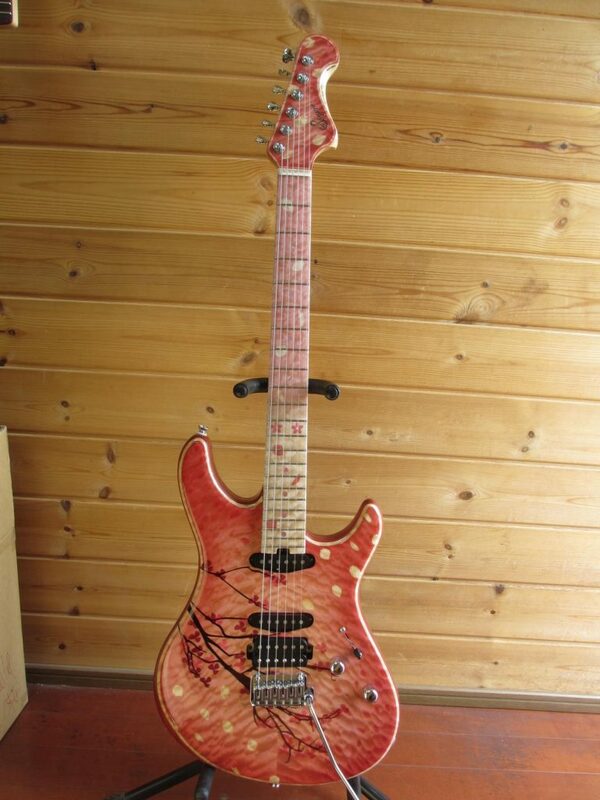 There are some guitars not only use Sakura design but also are made of Sakura wood. Mainly it is made of Asada Sakura. This tree is so good for acoustics, it is used in headphone, earphone or woodcone for spearker. 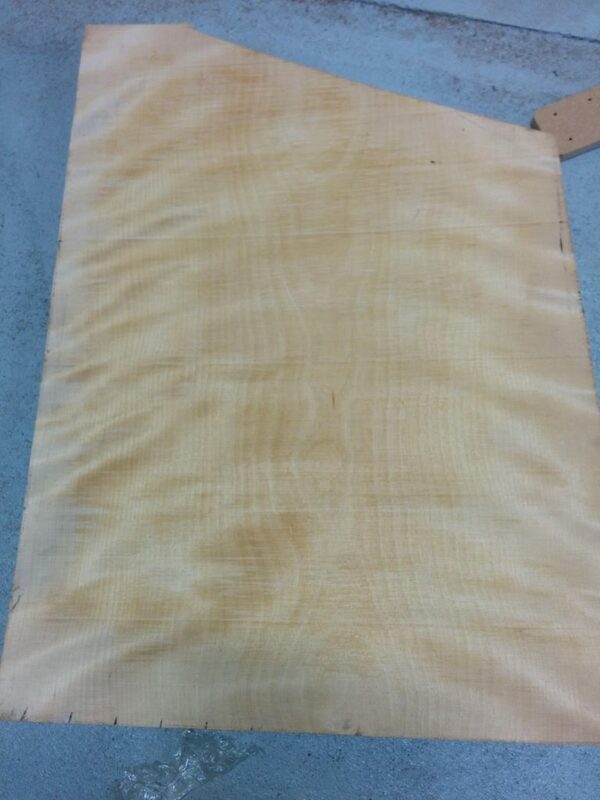 The material of this tree is hard and dense, enabling you to get a firm tone. So it goes together well with single-coil-pickups. When you play cutting using this Sonia which is made of Asada Sakura for the body and neck and is colored with a cherry sunburst, you can feel its sharp tone. We made this Sonia for the opeaning Sago. We show it in testing play booth as the roots of Sago. 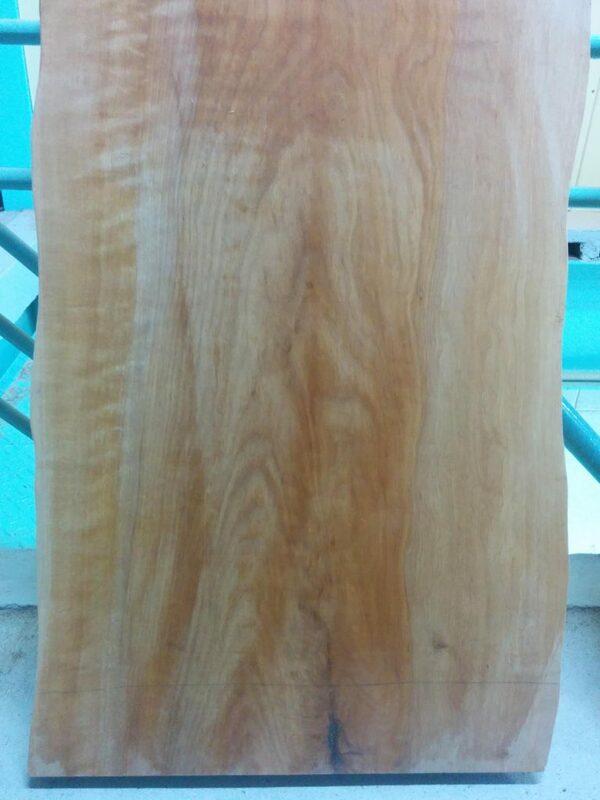 And we use the Mizume Sakura for the neck’s material, it is also hard. We line up the Sakura tree on the body top. We hope aroused the music stage with making the special instrument using Japanese design and material. At last, we will introduce the artist and songs who use our instrument. Mr. Shin Ohmura (WaggakiBand: Mr. Machiya) is belong to WaggakiBand. So many people already know this song because it played over a hundred million times on music video. It is said that this song is the world representative Sakura song. Mr. Yuichiro Kanda is belong to Tsuru. Tsuru’s “Sakura” is the memorial song that Tsuru’s menber of three with Afro hair played it using the guitars & basses of Sago when they come to our factory for the first time. That is all for the explanation this time. How do you feel? We will introduce you some models that feel you Japanese taste in Sago Blog. It is not certain terms. 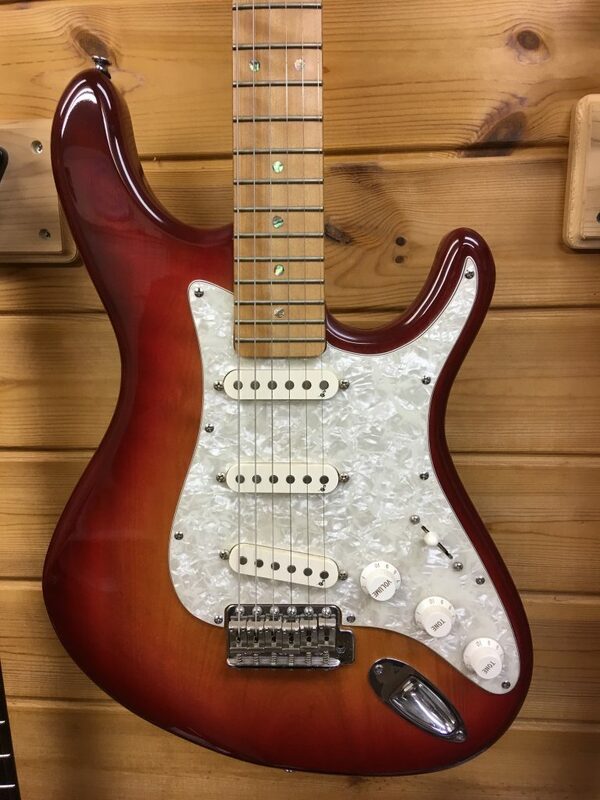 You will be able to get the best guitar for you. 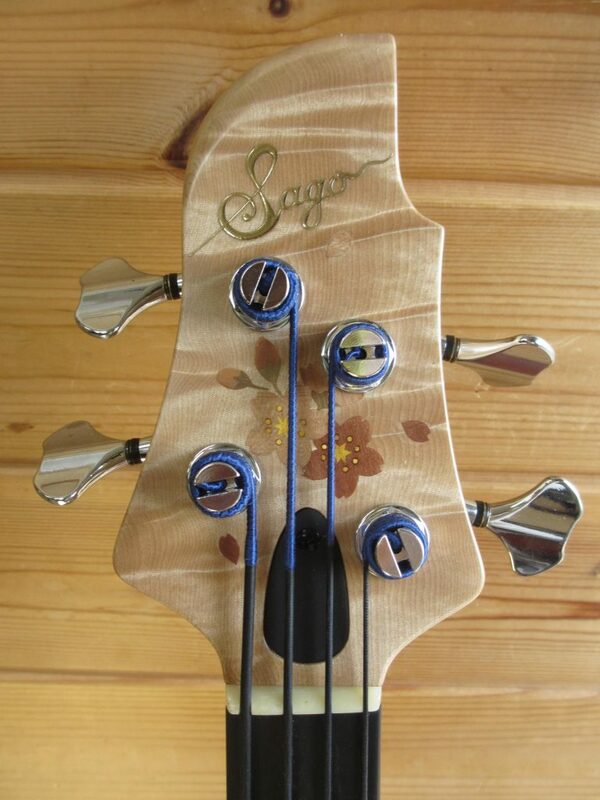 It has best color, design and figure for you if you order the guitar or bass to Sago.